Accidents can happen anywhere to anyone, especially on public transportation. When a person chooses public transportation, they are giving the responsibility of their travel to someone else, so when an accident happens, that service becomes liable. A public transportation accident can result in serious injuries and sometimes death. This can affect your current life and even your future. You might need medical care for the rest of our life, and suffer a loss in wages. Our lawyers at Joseph C. Crudo, PLC in San Diego, can help you through this difficult situation and find the compensation for your damages you have suffered from your public transportation injury. Why Should You File a Case? If you or a loved one were involved in a public transportation accident and were injured, or died, and your life has been affected in some way, you could have a strong case. This accident may have caused severe injuries that have resulted in expensive medical bills, future medical care, or a loss of wages. This accident was not your fault which is why you should hold the responsible party accountable for their mistake. You should not suffer a loss without receiving compensation for your pain and suffering. What is Considered a Public Transportation Injury? Injury sustained while riding in the transportation. Injury during entering or exiting transportation. Injury at public transportation terminal. Being hit by a public transportation vehicle while inside another vehicle. Being hit by a public transportation vehicle with your body. 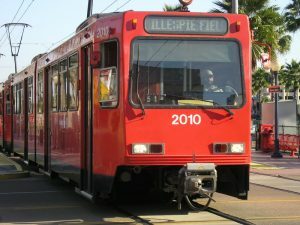 Our lawyers in San Diego at Crudo, PLC have extensive experience and knowledge regarding public transportation injuries. We want what is best for our clients, which sometimes means going through a tricky trial to gain what is theirs. Our team will handle your case by collecting all necessary documents including medical documents, witness testimonies, and any other evidence that will help your case. With our thorough attention to detail, we do not let any usable evidence sift past us. Leave your claim to us to focus on so you can focus on what’s important, regaining your health. With our effort, we will help you achieve a compensation that will hopefully help the situation you were unfortunate to be put in. The moment a public transportation accident happens and your life is affected, contact the law firm of Joseph C. Crudo, PLC to start your case for your public transportation injury. Give us a call at 858-622-7280 for your free consultation or use our online contact form to get in touch with us today.